Why would any responsible pet parent give human pills to dogs without consulting the vet? The answer is they won’t. However, dogs are born foragers and they have been known to ingest pills from the floor. To be safe, it’s always ideal to keep your pills locked up or someplace high off the ground. You can also keep your dog distracted by giving it a few chew toys to play with. These should keep it satiated for the day and prevent it from going on a hunting mission when you are not around. Also, make it a point to buy from reputed stores when buying pet drugs online. Some unethical online pet stores sell counterfeit pet drugs, which can end up causing harm. While no human medication should be given to dogs without the vet’s approval, some are more dangerous than others. The following are 10 human medicines that can cause fatal reactions in dogs. Paracetamol: It may be your go-to painkiller, but paracetamols are extremely harmful when ingested by dogs. An overdose of paracetamol causes liver failure, kidney failure, blood cell damage, and eventual death. 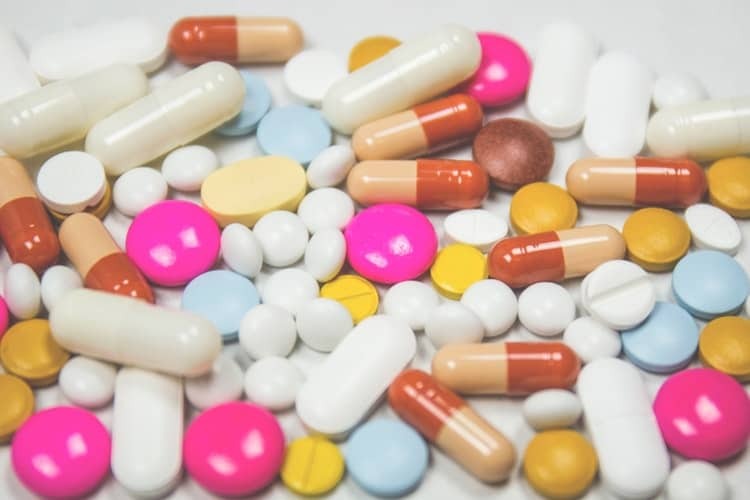 Morphine-Based Pain Medications: Any medication that contains morphine including Tramadol, Methadone, Fentanyl, and Codeine, are a serious threat to dogs. Accidental ingestion of a few pills can cause extreme wobbliness, severe difficulty in breathing. Fatal instances of toxicity from morphine-based drugs in dogs are not uncommon. Fat Loss Medications That Includes Caffeine: A lot of fat medications contain high amounts of caffeine. These fat loss pills are often dangerous for humans, let alone dogs. Caffeine poisoning leads to shivering, seizures, and heart failure. Naproxen: Another popular human pain medication on our list, Naproxen can be fatal to dogs even in low dosages. Vitamin D Supplements or Pills: Anything that contains high amounts of Vitamin D can be dangerous for dogs. Vitamin D poisoning (Yes, it’s a real thing and it affects humans) can be fatal for dogs. It often leads to seizures, violent muscle spasms, and heart failure in dogs. Bodybuilding Supplements: Some pet parents think that bodybuilding supplements will help their dogs grow muscles and get stronger. Bodybuilding supplements contain high amounts of micronutrients. Some of these nutrients, when consumed in excess amount, can be fatal to dogs. Unable to digest these supplements, dogs often have bloody diarrhea and other serious stomach ailments. Pseudoephedrine: Pseudoephedrine is a group of human medications that are used as decongestants. As low as 3 pills, if ingested by a small dog, can be fatal. Ibuprofen: According to some statistics almost 3% percent of all dog owners make the mistake of feeding human painkillers to dogs. Dogs overdosing on Ibuprofen often experience bloody diarrhea, kidney failure, and vomiting. Alprazolam: Alprazolam is a well-known medication that’s used to control sudden bouts of anxiety and sleeplessness. If your dog is suffering from anxiety, it’s best to consult a vet. There are plenty of safe anti-anxiety pet drugs that can help calm the nerves. Feeding Alprazolam can cause severe drops in blood pressure levels and can easily be fatal. Clonazepam: Clonazepam is a human anti-anxiety pill. It can lead to violent shivering, severe weakness, and sudden drops in blood pressure levels in dogs.